We have done quite a bit of domestic travel with Eva within the last two years. We’ve flown back home to Virginia on several occasions (birthdays, Christmas, weddings, etc. ), flew to Seattle for weekend trip, drove down to LA multiple times to go to Disneyland, took weekend road trips to the Central Coast (Solvang, Pismo Beach, and San Luis Obispo) and Tahoe, and day trips to Monterey and Santa Cruz. Road trips are quite different from air travel. Each has their pro’s and con’s especially with a toddler. Tips for a road trip with a toddler will be coming up. But today let’s talk about how to make air travel with a toddler bearable. Since Eva was born we’ve flown domestically with her anywhere from 2-4 times a year. In the beginning, each trip was approximately every 5-6 months apart. We have learned a few things about traveling with her. Red eyes are not ideal. We did it for her 1st birthday. Big mistake. 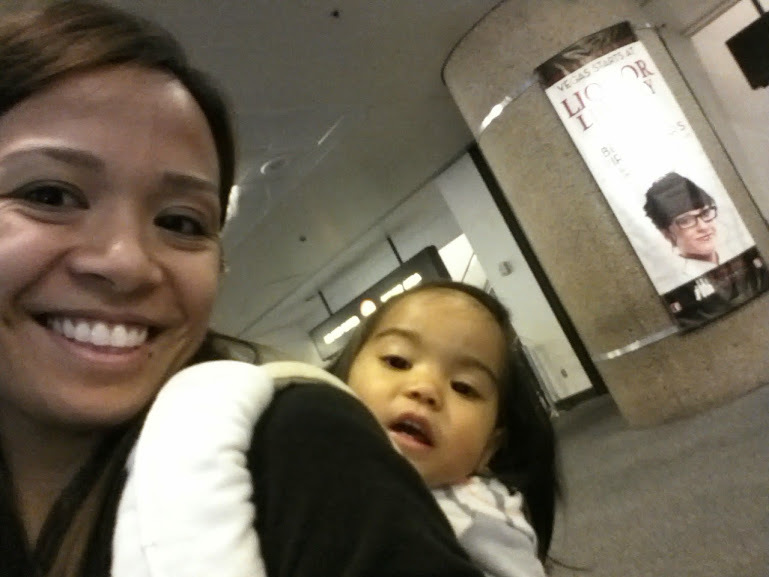 Instead of being tired as we boarded the plane, she was quite energized. It was a pretty painful flight and by far, our worst flight with her. We did it again last summer and surprisingly she did fine. She slept most of the time and slept again when we got to my mom’s house. So perhaps the first flight was an anomaly? We do find that she does well on early morning and afternoon flights because she’s tired from waking up so early or we’re taking off during her nap time. We’re typically flying to Virginia, so we’re usually in the air for about 3.5 to 6 hours, depending if we have any layovers. She’ll sleep for an hour and a half to two hours during the flight, either at the very beginning or the tail end. So we have to keep her entertained for about 3 hours in hopes of no meltdowns before we land. We haven’t really had any major meltdowns yet (except that 1st red eye). Here are my tips on having a successful flight with a toddler. These tips aren’t inclusive to a toddler but could be adapted for a baby or 5-10 year old. 1. 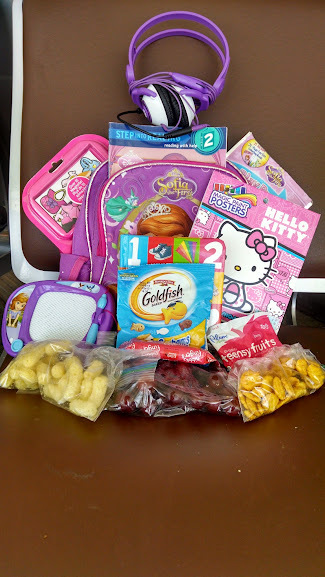 Pack a backpack or bag or diaper bag with the essentials. You’ll probably be the one carrying this bag of fun-ness around depending how heavy it is. Diapers or underwear (if your little one is potty trained) – ALWAYS double the amount you think you’ll need. You never know if you’ll be delayed especially during the winter snowstorms or peak spring break/summer travel months. Wipes – Again, double the amount you think you’ll need. Wipes are so versatile, other than using them for diaper changing, you can use them for possible vomit situations, wiping down the armchairs/windows/tray table for your toddler, sanitizing your hands, cleaning yourself or your toddler up for any messy food situations or any situations really, etc. Changing mat – This is pretty self explanatory. Disposable plastic diapers bags or reusable wet bag – See poop explosions or vomit situations above. If you have a child that isn’t potty trained yet, I’d suggest having multiples on hand for dirty diapers and the other for dirty clothes. 2-3 pairs of extra clothes for him/her – Again, see poop explosions or vomit situations above and lets not forget messy eating situations. Also, if your destination is a different temperature than your departure city, it’s good to have extras layers (if cold). Blanket and/or stuffed animal they like to sleep with – Eva loves to have a blanket when she naps. She feels secure when she has it. On one occasion I forgot her blanket, but thankfully my scarf was large enough to serve as a blanket for her (even though I ended being cold! oh the things we do for our children). Try to make your tiny space relaxing for a nap (if they take naps). Sippy cup or bottle – Because airline cups aren’t spill-proof for toddlers. This is also good to have as the sucking motion can relieve ear pressure when taking off and landing. Lollipops or sucky pouches – Again, this is to avoid any ear pressure during taking off and landing. Snacks that they usually have on a day to day basis – This goes with the comfort thing. Plus airline and airport food are just ridiculously expensive and not completely healthy. Children’s ibuprofen or acetaminophen – Just in case. Children’s Dramamine – Just in case they start getting motion sickness. Extra shirt or two for you and another pair of pants – Again, see vomit or messy eating situations above. You’ve cleaned up your toddler but you possibly have a sour smell lingering on you for who knows how long. It may not happen, but you never know. I like to be prepared (probably a reason why I will NEVER go backpacking. I need too many things just in case!). This is her entertainment backpack. I kept her diapers and the essentials in my bag. Snacks or treats (that aren’t loaded in sugar!) they don’t normally have – Because special treats always keep toddlers quiet. At least it keeps mine occupied. Crayons or markers (preferably washable) – Next best thing to food to keep my toddler quiet. Drawing. The colors and the sensation of making something on her own keeps her quiet for a good 30 minutes to an hour. Paper or coloring books – See crayons or markers above. 2 mini toys (dollar store, value area at Target or Michael’s have been helpful for us) – Because drawing will only last for so long. I suggest that they be new toys that they haven’t played with before to keep them occupied a little longer and giving it to them one at a time. I made the mistake of showing Eva everything and she got tired of them within an hour. I had nothing left to entertain her with that trip except my phone. Charged up tablet or phone with movies or shows and educational games/apps loaded – Because Disney Junior/Nick Junior and games will keep them quiet for a good portion of the flight. I’d suggest setting a limit on how long they can use the tablet or phone. Also, consider trading time between watching shows or playing games on the tablet with drawing or eating or playing with the mini toys and back again. Sometimes we let Eva watch for an hour but we don’t let her watch the rest of the flight since she can eat or draw. Sometimes we’ll break that time up and distract her with food and then give it back to her after she’s done eating. Toddler Headphones – Because not everyone wants to hear the “Hot Dog” song. We use these, as pictured above, as they soften the sound for kids’ ears. 3. If you’re traveling alone with a toddler less than two years old, pick a window seat when booking your seat. If you’re traveling with someone, pick the window and aisle seat. Usually travelers aren’t keen on selecting middle seats, hopefully leaving you with an open middle seat. However, if the flight is packed this may not be an option. If someone does take the middle seat, politely ask them if they’d like the aisle seat so your toddler doesn’t disturb them. Chances are they won’t pass it up. But why pick a window seat? Why not the aisle so that your kid can walk up and down the aisle? I found that Eva loves looking out the window and is mesmerized by what she sees outside. Also, I’d prefer to not sit in the aisle with her on my lap because she knows she can get out. She hasn’t but there is that possibility she can run up and down the aisle disturbing other passengers. I’ve seen toddlers do this firsthand and oh the glares parents get. 4. I personally don’t like using a stroller at airports. While they’re convenient and you don’t have to worry about toting the stroller and your luggage. Plus it’s added time getting onto the plane or off since you have to gate check it. Consider using a baby carrier, if you can, to get your toddler from the security checkpoint to your departure gate to baggage claim, quicker. It makes it easier to have them on your back while you wheel your pilot bag and diaper bag on top. No running after your toddler around the airport. Well that is until you get to the gate and let them out. Here’s Eva at a year and a half hanging out in the carrier at baggage claim. 5. Get to the airport early. You never know when a toddler wants to take their time (Mine does when we’re in a hurry and is in a hurry when we’re not. Oy vey!) especially walking around a new area. 6. If you’re with a spouse or a friend or a family member, take turns. When one is getting frustrated, pass them along to your spouse or friend or family member for a couple of minutes to gain your composure. This goes along with sleeping on the plane. 7. Meditate before hand to prepare yourself and take a few breaths to compose yourself. Eva definitely lets out a little cry here and there, but nothing awful. But my husband and I try to mentally prepare for those situations because with a toddler you never know. There’s an unspoken agreement that we’ll take turns caring for her if it comes to that point because we both can’t be frustrated in an enclosed space 30,000 feet in the air with nowhere to go. Toddlers have a mind of their own. Do what you can to keep them pleasantly entertained. If they have a meltdown, it’s fine. Try to calm them down as soothingly as possible or distract them. Use that bag of goodies to your advantage! Maybe pack a couple more goodies in your carry on as backup. If Eva knows something is for mommy or daddy, like chips or chocolate or cookies or our phones, and we give it to her to eat or play with, she gets so giddy and happy. They want to be grown up like you! Sure some passengers may be frustrated with you and your child. Oh well! As long as you’ve done what you can to best of your ability to keep your toddler happy and satisfied, there’s no need to say sorry for a little crying. If she whines for 5 minutes, I’ll call that a feat in itself, especially with a terrible two or trying three toddler. This sounds awful of me but after reading this article, I refuse to be sorry. I hate to be a “deal with us” type of family, but I’m trying to best of my ability to keep my toddler quiet. Keywords are I TRY TO THE BEST OF MY ABILITY. I am guilty of judging other parents who aren’t prepared or appear to not give any effs and let their kids run wild on the plane. I really don’t like that I do, and I try not to because they could be having a bad day or kids may have special needs or maybe their kid is in pain due to altitude pressure and can’t deal with it. What are your air travel tips with a toddler? Share below! Happy travels! I’m going to share a secret that’s not so secret, I LOVE anything blue or purple. I LOVE it even more if you combined the two colors together. Maybe it’s because they’re cool colors and exude calmness, which I am not. But I have always loved purple and blue. When I buy clothes I have to tell myself to stop gravitating towards blue or purple items. I’m usually good about it but sometimes I’m not successful. I know you’re saying hey it’s fall, why are you sharing an outfit post with shorts. Because I it still is summer… especially if you’re in the Bay Area, it’s an Indian summer. It’s cooled down this week with all the rain passing through, but it’s supposed to heat up next week, getting up to the high 70s to mid 80s. But sadly I won’t enjoy the weather because I’m heading to the UK next week for work where it’s supposed to be chilly and rainy. (cue sound: whammmmmp whaaaammmppp. you’re in the uk, stop complaining!) Usually by this time I’m ready for fall and to take out my boots and chunky sweaters, but for some reason this year I’m not. I think I’m still in love with the vacation we took a month ago and the association with summer and summer clothing. Anyhow, while in Barcelona, I originally started the day wearing just a white tank top with my purple chino shorts from Banana Republic because it was supposed to be hot. We went up to Mount Tibadabo to overlook the city and it got a bit chilly while at the elevated level, so I took my chambray button up out of the backpack and put it on to keep myself warm. I LOVE how the outfit came together. I love the color combo. I think there may be another outfit post featuring these shorts. With that outfit I practiced colorblocking and it was THE perfect summer outfit for colorblocking. LOVE!